Little to no Waste: This style of weaving starts in one corner and ends in another, all the while pulling from a skein of yarn (or several if you’re using multiple colors). You don’t warp the loom separately; it happens along with the weaving. Because of this, you don’t have that thing weavers call waste, which can be fairly small or large, depending upon the loom and project. The only waste that occurs with continuous strand weaving is the trimming of fringes–and you don’t even need to have fringes. Exercise: Okay, this one is kind of strange and certainly not for everyone, but I like weaving while standing and walking and not feeling I’m stuck in one position. Tactile: If you ventured into weaving because you like handling fiber, you’ll really enjoy continuous strand weaving, which is about as “close” to weaving as you can get. You don’t even use a shuttle. Speed: This can be a very fast way to weave. If you’re using bulky yarn and creating something like a scarf, the time committment can be as little as three or four hours from beginning to end; however, adding in something like color changes, patterns, thinner yarn (or doubling on each nail), and you’re also adding more time. 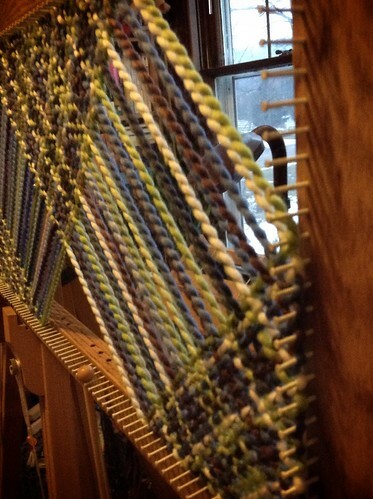 Happiness: For me, this type of weaving feels a bit earthy and, also for me, it makes me happy. Is it the larger sett? The simple patterns and structure? The surprising versatility? Whatever it is, it clicks with me. Space: This loom is pretty big. (Okay, most looms are pretty big.) Even though it stores easily behind a door, under a bed, or even breaks into pieces, while you’re working on a project, it’s possible having a big rectangle on an easel and having to step around it, move it, bump into it, etc., could get a little annoying. Some weavers figure out very inventive ways to weave on these frame looms by attaching them to walls, which is great if you’ve got the space. They can also serve as an abstract type of art. Mistakes: If you spot a mistake with this type of loom, you can fix it if you have the endurance and proper attitude. You can unweave to the mistake and then reweave, which could be time consuming. However, mistakes are often not discovered until the project is off the loom. In that case, you can fix them with a needle and yarn by reweaving over the area. The drawback I’ve found is that I can still spot the area that’s been patched, and so mistakes in continuous strand weaving stand out to me. I think I put it into the category of “happiness” above. If you can accept the float, just keep on weaving. Try not to let your float from Peg 4 force you to unweave when you’re nearly finished. Patch it up and move on. There’s a very good chance no one will ever spot it, or they’ll chalk it up to that “earthiness” factor mentioned above. Gauge of Yarn: I happen to love working with worsted weight yarn and bigger sizes, so it’s fun for me to use up all those skeins I’ve accumulated. Maybe that’s not true for you. Some extra time and patience is required when choosing a smaller gauge. Although I’ve seen some truly beautiful weavings from continuous strand looms, they’re sometimes a little different than a weaving created on an eight-harness floor loom. It’s a unique feel and look, although a pattern is a pattern, and you can certainly weave twill and overshot on this model if you’ve got the creativity and know how. The More You Weave, The Longer it Takes: There’s a curious thing that happens with this type of weaving. Because you create each warp thread as you weave under and over the existing ones, you’re adding in two extra strands with each pass. That means each time you finish a pass (meaning going all the way over and all the way back), you’ve just created more work for the next time. The closer you get to finishing, the longer each pass takes. When you first begin a scarf, it can take just one minute to do a pass. In fact, the first ten to fifteen passes take next to no time at all. However, after that, the project grows, the warp threads multiply, and it takes longer. So, there are times I’m looking at the nearly-finished scarf with just a handful of “passes” left, and I know it’ll take as long as the first half. This is one of those “you have to experience it to understand” things. Maybe it’s like exercising. That last mile of running can seem as long and difficult as all the other miles that came before, but you can’t get to the last mile if you haven’t run all those others first. I know just how you feel on that last point. I find myself adjusting my time commitment daily to each loom project based on where I am as I proceed toward the center of my tri-loom. At first I do the first 20 or so pegs along the top, then each day thereafter I do 5 pegs for about a week. Then I really slow it down to 2 or 3 pegs daily for the remainder of the project. Slow and steady wins the race in my book. I am new to rectangle loom weaving and I am finding your projects very interesting. Thank you for sharing your thoughts and photographs. I am working on my first rectangle loom project and have seen your creations. I have a better idea now of how to plan out color changes as I was feeling a little lost. Thanks again!